SPEEDbit Video Accelerator for Mac is a powerful utility that lets you enjoy the world of internet video at accelerated speeds. It is installed to your Menubar and configures itself automatically so you can start watching accelerated videos right away. Videos on YouTube and 165 of the most popular video sites. Music, music videos, movies, and TV shows. To ensure the best performance from Video Accelerator you should make sure to always use the latest version. To check for updates, click the Video Accelerator Menu item located in the Menubar. Click Check for Update and Video Accelerator will look to see if an update is available. Video Acceleration is turned on by default. To turn of acceleration, click the Video Accelerator Menu item in the Menubar. Click Turn Video Accelerator Off to turn off acceleration, and Turn Video Accelerator On to restore acceleration. 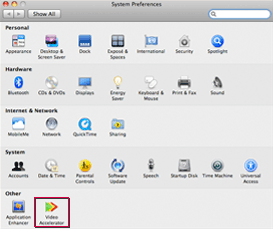 To access Video Accelerators preferences, open your Mac's System Preferences application. In the Other category, click the Video Accelerator preferences pane. Select this option to allow Video Accelerator to accelerate videos and iTunes downloads. Select this option to display the acceleration animation when Video Accelerator is running. When your 15 day trial of SPEEDbit Video Accelerator for Mac has ended, you can purchase a yearly subscription and continue watching web videos, HQ videos, and HD videos without the wait. 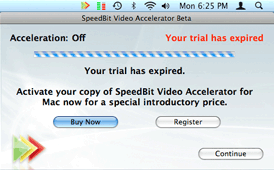 Find out more about purchasing SPEEDbit Video Accelerator for Mac. To register your copy of Video Accelerator, open the Video Accelerator preferences pane in System Preferences. Click the Register button to enter your registration code.